ROLLING WITH MAUA TOWARDS EQUALITY"
The NGO Wanawake Woman in partnership with Tricracy creates an innovative proposal to work on the visibility of women in sport and in society in general and favor gender equality. The proposal for awareness and participation will be led by the team female Tricracy, and has the objective of getting all the adventurers of the Titan Desert, as well as society in general, involved. Sport is an exceptional tool to work on gender equality. Promote healthy habits among women through sports. Encourage the participation of women in sports and their visibility. Make visible everyday situations in the life of women that generate inequality, becoming aware of them. Publicize the importance of inequality as a basis and principle of violence against women and girls. Propose a protest and awareness-raising action with a playful and participative methodology that promotes reflection and a critical vision of society. Offer a product that allows visibility to women victims of violence and generate resources for them. Invisibility: the work that women perform continues, on numerous occasions, to be invisible. A clear example is women´s sport, with the great achievements we have accumulated in recent years. Women, despite their enormous efforts and achievements, practically does not exist in many areas. Gender violence that, in many cases, ends in murder. Violence against women is the ultimate expression of gender inequality. Too many traditions and cultural practices that violate the most basic rights of girls and women. To face this situation, from Tricracy and Wanawake, we want to launch a challenge to the participants: "FILL THE DESERT OF FLOWERS ROLLING WITH FLOWERS TOWARDS EQUALITY", as an allegory to fill the wilderness of WOMEN. 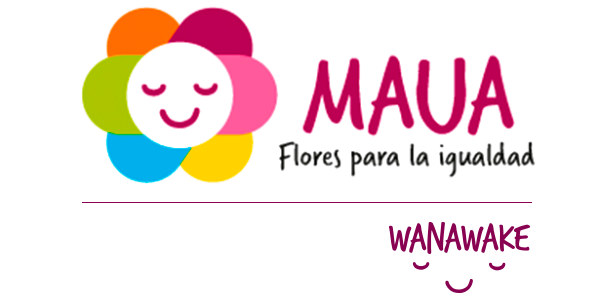 The MAUAS / flowers represent our women, the most invisible women, those who have suffered the most radical practices of gender violence! More than 200 million women and girls have been genitally cut without a medical reason, 3 million every year, in more than 28 countries. Every minute, 23 girls are forced to marry. They total more than 650 million worldwide. Nearly 24 million women and girls have been victims of trafficking in persons for the purpose of exploitation. They are 80% of the total, and if we talk about sexual exploitation almost the whole (98%). Help us fill the desert of the Garmin Titan Desert with flowers!